Look here: 1. 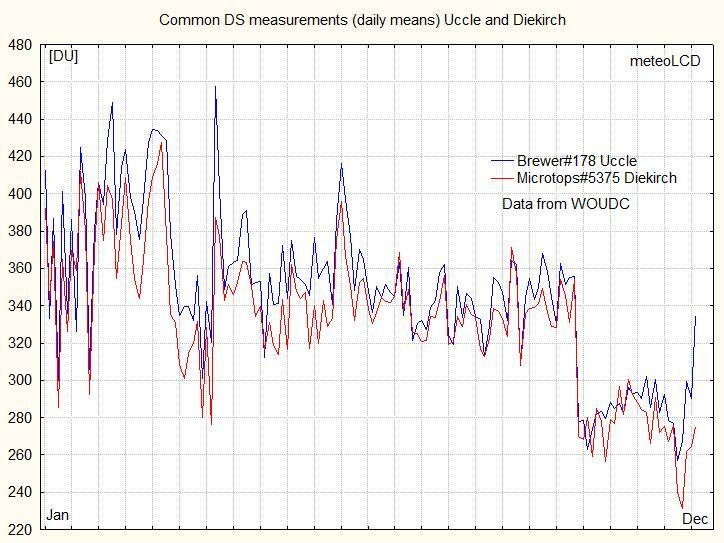 Intercomparison between the ozone measurements of the Microtops II and those made by the Brewer instrument at the RMI at Uccle: 2012, 2011 and previous years. 2. 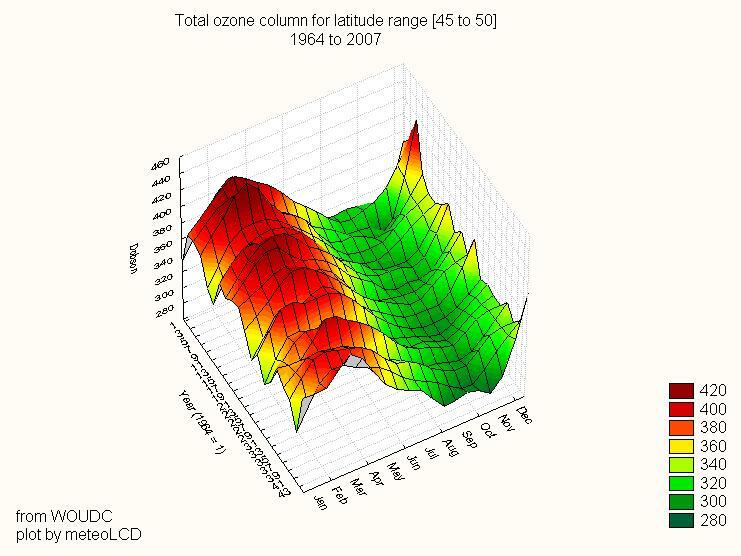 Overplot of 2014 Uccle and meteoLCD total ozone measurements. Comparison and Calibration plots for common direct sky (DS) measurements. The total thickness of the (stratospheric) ozone layer is measured at unspecified, irregular intervals using the handheld Microtops II sensor manufactured by Solar Light Company of Philadelphia. This instrument measures the thickness of the ozone layer by computing the ratios of UVB irradiances measured at three different wavelengths; the water vapour content of the atmosphere and the AOT (aerosol optical thickness) are also measured by the instrument. The measurement results are given in DU (Dobson Unit). 100 DU correspond to a total thickness of 1 mm, if the ozone layer were at a standard atmospheric pressure of 1013.25 [HPa]. Common values are in the 250..350 DU range. 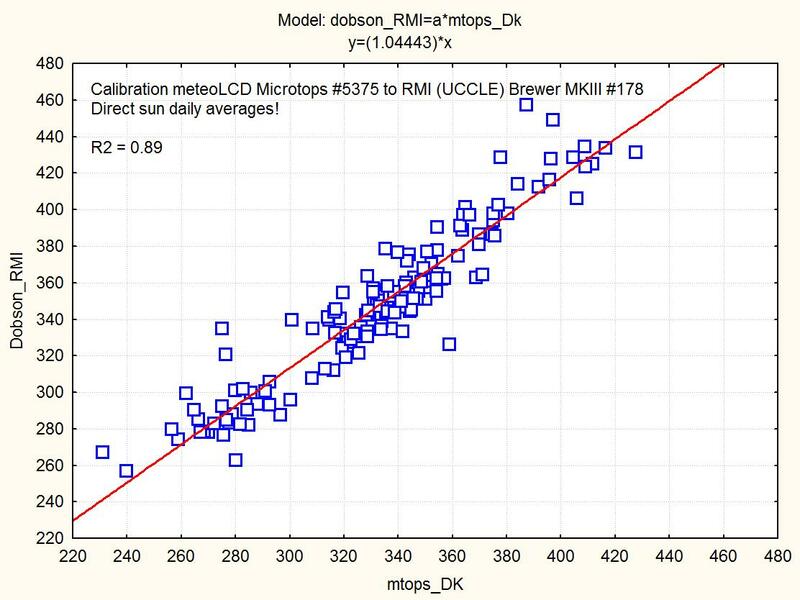 The previous years dobsonyy.html files and the Microtops measurement files can be found in the data area! Attention: blue lines correspond to measurements done using instrument #3012 (operator Mike Zimmer). From 01Jan to 31 July: The data in the table are the original readings multiplied by the calibration factor 0.908658 (new calibrated instrument_5375 = 0.908658*instrument_3012) . Comparison tests made from 15Sep to 02Oct 2009. From 01Aug to end of the year: The data in the table are the original readings multiplied by the calibration factor 0.8822 (new calibrated instrument_5375 = 0.8822*instrument_3012) . Comparison tests made during June and July 2015. Starting 15 Sep 2009, Microtops #5375 is back from calibration at Mauna Loa. Purple data correspond to the new calibrated readings. There is a big difference between the readings before and after calibration. For some time, measurements will be made with both Microtops, and a conclusion drawn thereafter. 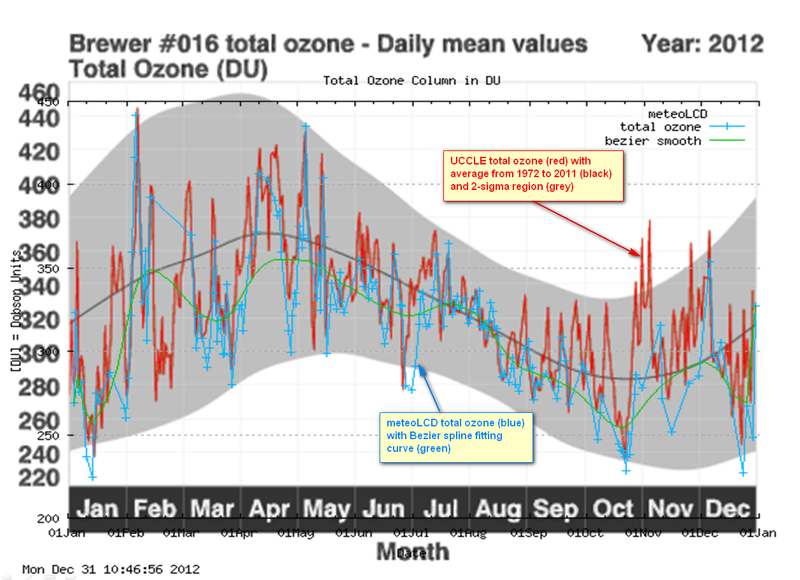 Green ground ozone data should be considered unreliable!